Michelle prepared a Japanese theme meal for the South Arm Older Adults Cooking Club. 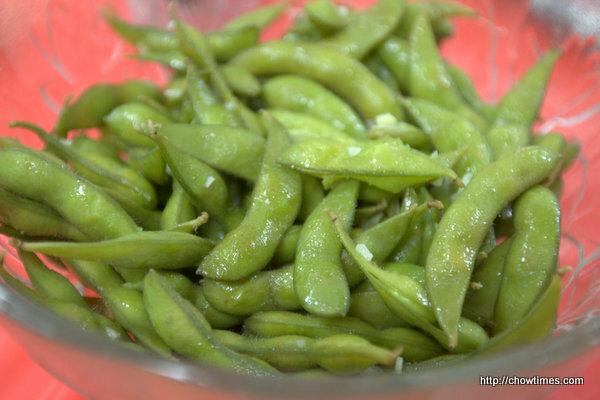 The first recipe is Garlic Buttered Edamame. 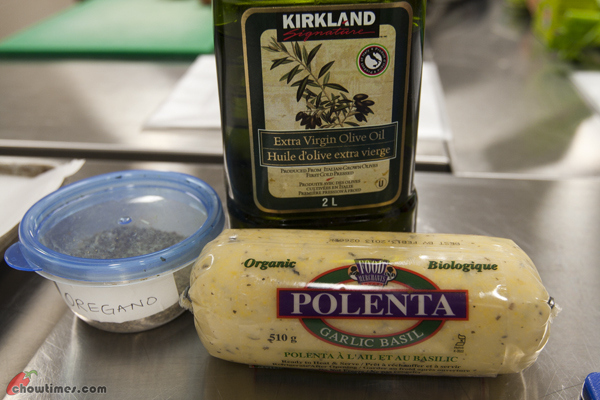 The South Arm Older Adults Cooking Club met up for another cooking session in February. 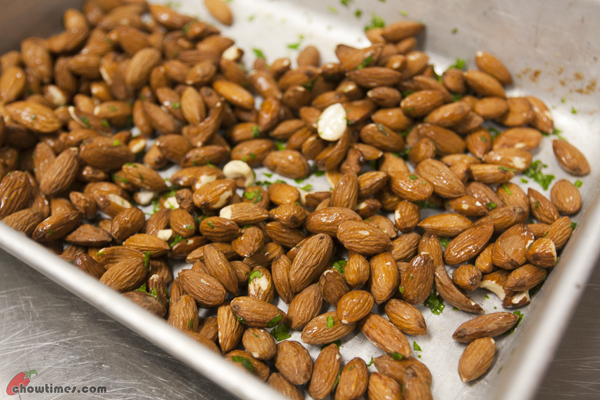 The first recipe that Michelle introduced was Roasted Almonds with Herbs. 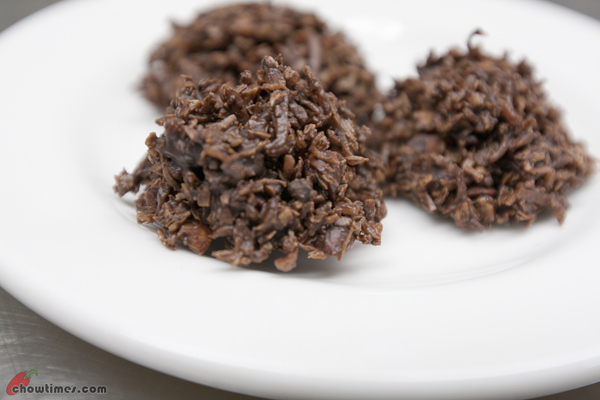 You can try this recipe with different nuts like walnuts, hazelnuts and pecans. Here are the benefits of almond shared by Michelle; source Wikipedia. Almonds are a rich source of Vitamin E, containing 26 mg per 100 g. About 20% of raw almond is high quality protein, a third of which are essential amino acids. 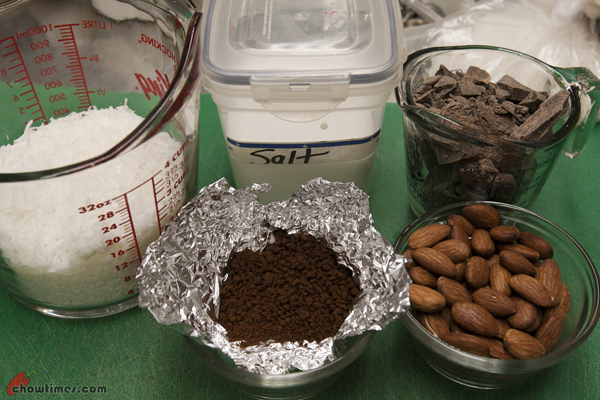 An ounce of almonds contains 12% of necessary daily protein. 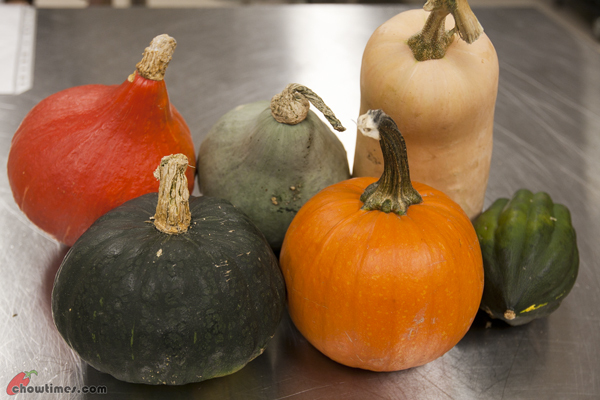 They are also rich in dietary fiber, B Vitamins, essential minerals and monounsaturated fat, one of the two fats which potentially may lower LDL cholesterol. 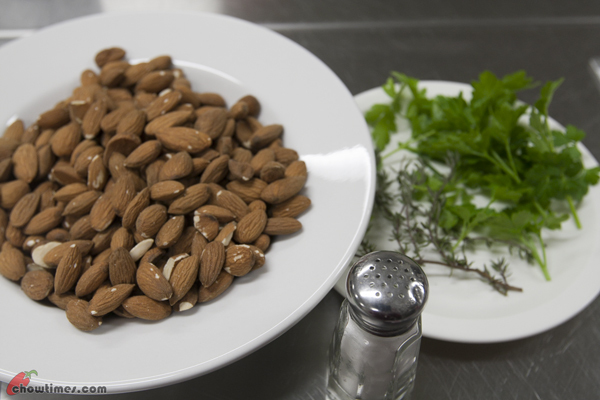 Typical of nuts and seeds, almonds also contain phytosterols, associated with cholesterol lowering properties. The parsley and thyme were from Michelle’s garden. You can try other herbs like rosemary, sage, marjoram, etc. Minoo served the dips with Homemade Baked Tortilla Chips and Pita Chips. 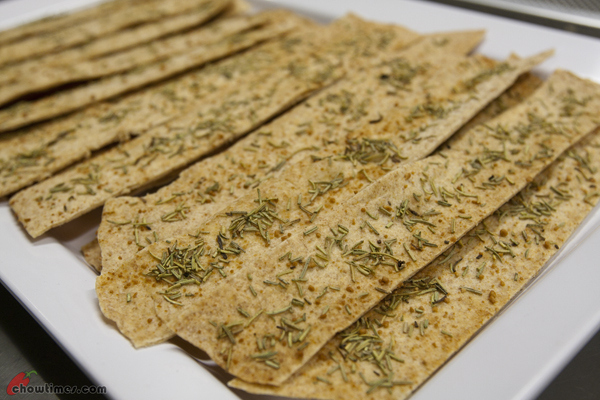 The Homemade Baked Tortilla Chips were flavoured with rosemary while the Homemade Pita Chips where flavoured with basil. Both were crispy and flavourful. 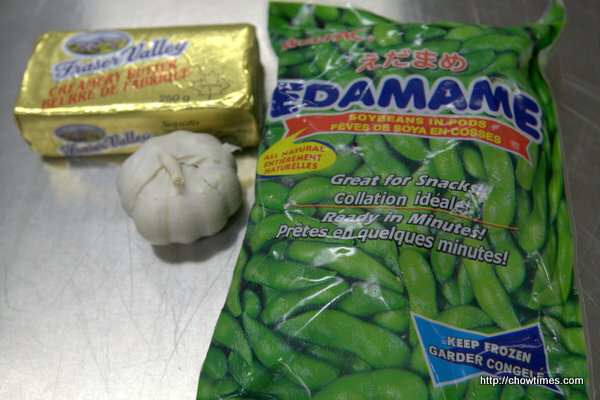 They were great for snacking even without any dips. 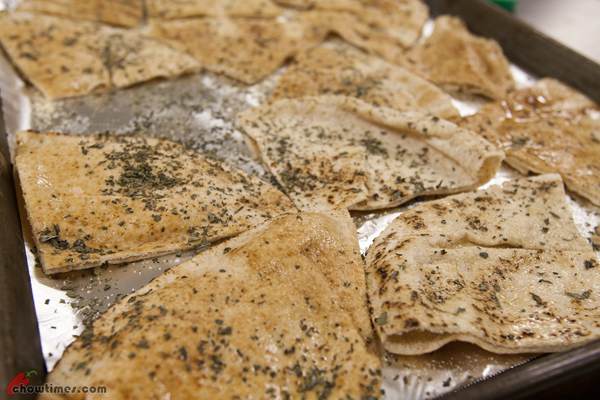 This is a great way to use up leftover tortilla and pita bread. What do you do when you have left over ripen bananas? Normally, I will bake a banana cake. But, since it’s summer, I would not want to heat up the home with the oven. Another of my favourite recipe with banana is Steamed Banana Cake but I don’t feel like having it this time round. So, I made something even simpler and sweet for lunch. 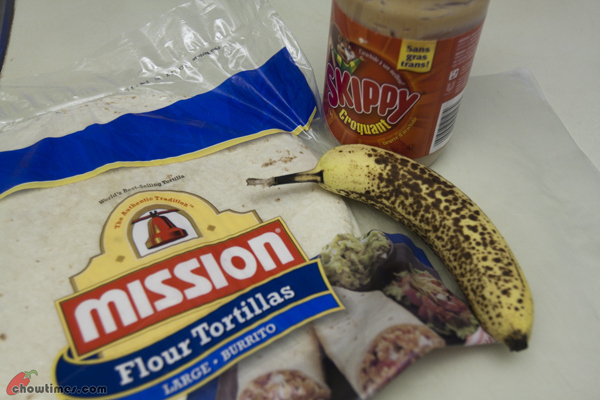 This Grilled Peanut Butter Banana Tortilla is great for snack or dessert. It is warm, gooey, sweet, nutty, crunchy and crisp. I love it so much that I had this three days in a row. It can be messy eating this though because the filling will be squeezed out when you bite into it. 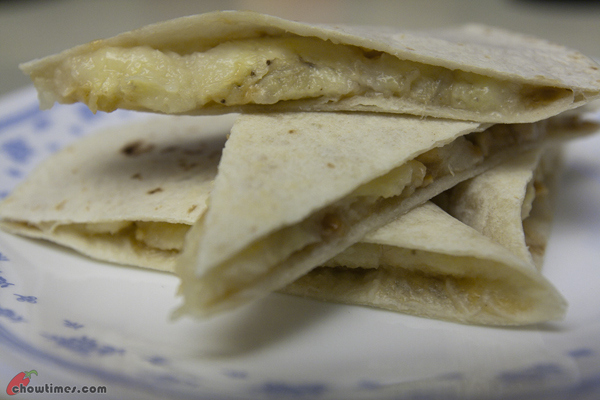 At times, the natural syrup from the warm banana will dripped from the tortilla. I also find that the Nutella is more messy as it turns more liquid when heated. 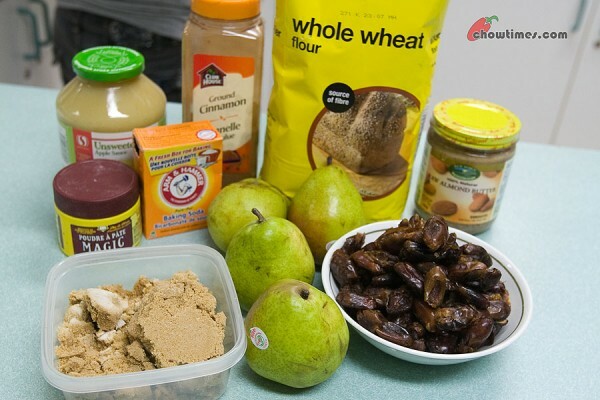 For dessert, Minoo shared a Pear, Dates and Almond Butter Muffin recipe in the South Arm Community Kitchen. Pears are high in fiber and contain a good amount of vitamin C as well. 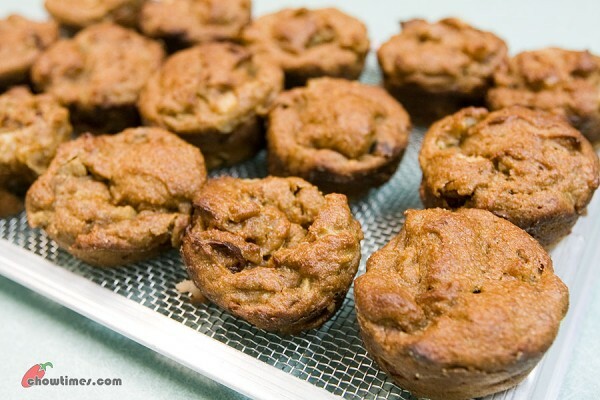 These Pear, Dates and Almond Butter Muffins make a tasty and nutritious breakfast to go. They are moist and not doughy. 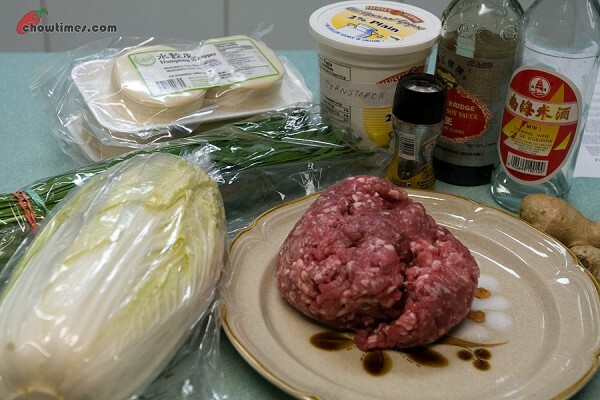 The main Chinese New Year dish made in the South Arm Cooking Club for Seniors is Boiled Pork and Cabbage Dumplings. 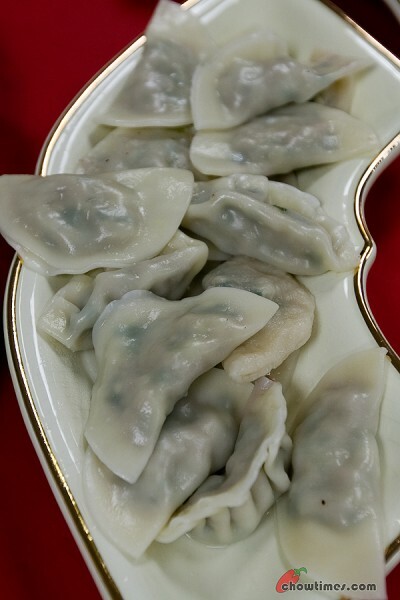 Dumpling or jiaozi is a traditional dish eaten during Chinese New Year’s Eve and some other festivals. Family members gather together to make dumplings as wrapping dumplings is quite time consuming. Such activity also brings the family closer. Dumplings can be boiled or pan fried. Boiling is a healthier choice of cooking. Dumplings can be freeze on the baking sheet. Once they’re completely frozen, place them in a ziplock bag for future consumption. Chris O’Brennan, Helena, Sdyney, Frances and Chris made these dumplings. 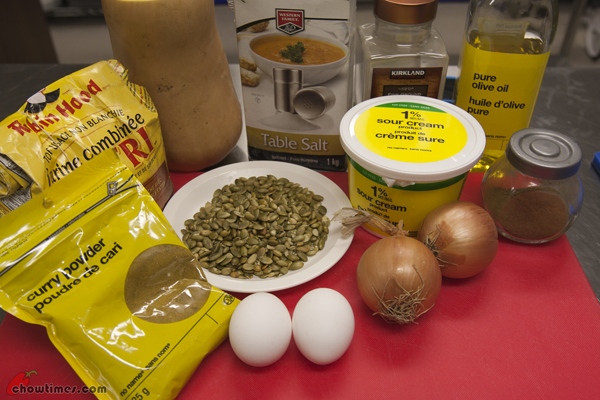 The second recipe demonstrated by Minoo in the South Arm Community Kitchen is an Indian recipe. 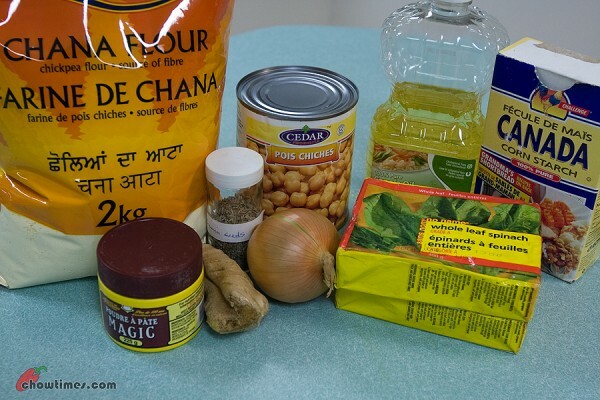 It is Spinach and Chickpea Fritters. 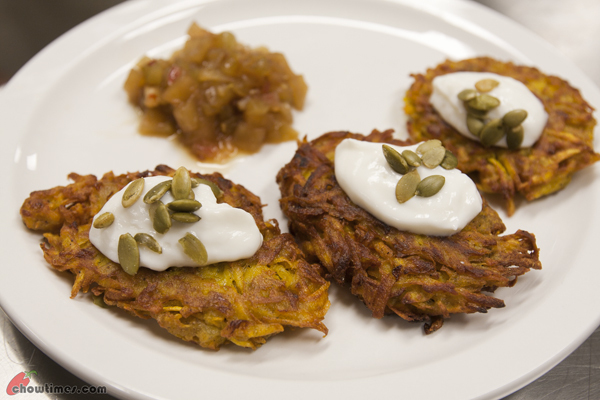 These vegetarian fritters can be served as an appetizer or snack. 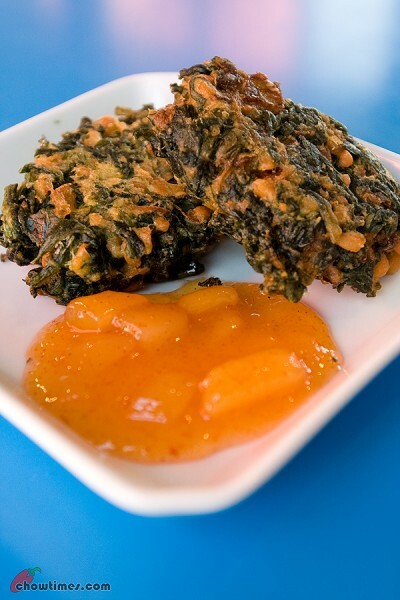 Minoo served the Spinach and Chickpea Fritters with a store bought mango chutney. 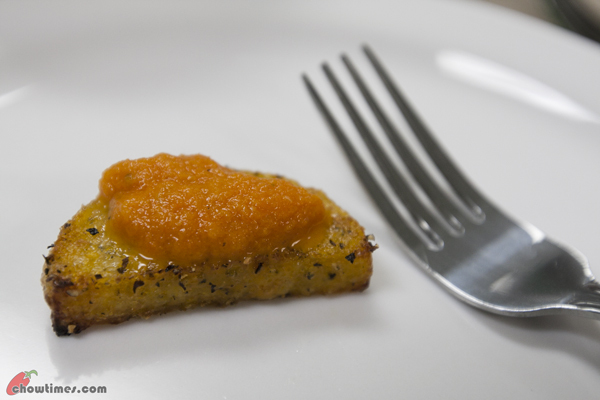 The fritters are fried to very crispy and they are great snacks with vegetables in it.